Congressional Republicans are making a last-ditch effort to repeal the Affordable Care Act (ACA) through their latest plan, from Senators Cassidy and Graham, and reportedly are close to securing the votes of 50 senators needed to push the bill through the Senate before September 30th. Such a strategy would violate the principals of “regular order” even more egregiously than the non-transparent, partisan process of the previous repeal bills. It would amount to passing a poorly understood bill through the Senate within two weeks without hearings, floor debate, input from constituents, and without a comprehensive Congressional Budget Office (CBO) analysis of the bill’s impact. 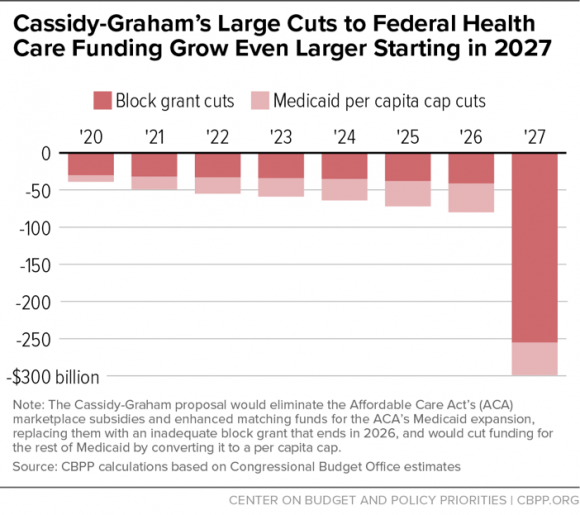 Senators Cassidy and Graham and their counterparts appear set to take the exact approach they criticized, precisely in order to hide the bill’s damaging impact on coverage, consumer costs, and consumer protections. This bill is in many ways as bad as – or worse than – previous repeal bills that have failed to pass Congress this year. This entry was posted in National News on September 27, 2017 by merceralliance.